It's really strange to be doing a Memebox review for a box no one can get any longer but that's okay. I've been missing the old Memebox anyway. I can hardly believe the changes and how drastic they seem. This is Memebox Hair and Body 4. It's not a box I would normally consider but there is a product I've been wanting to try in the box and it was actually cheaper to do it this way than buy it from Korea and pay shipping. Memebox sells Korean beauty products and value Box Sets from a base in the USA. This means that shipping times are short and your products arrive to you quickly. 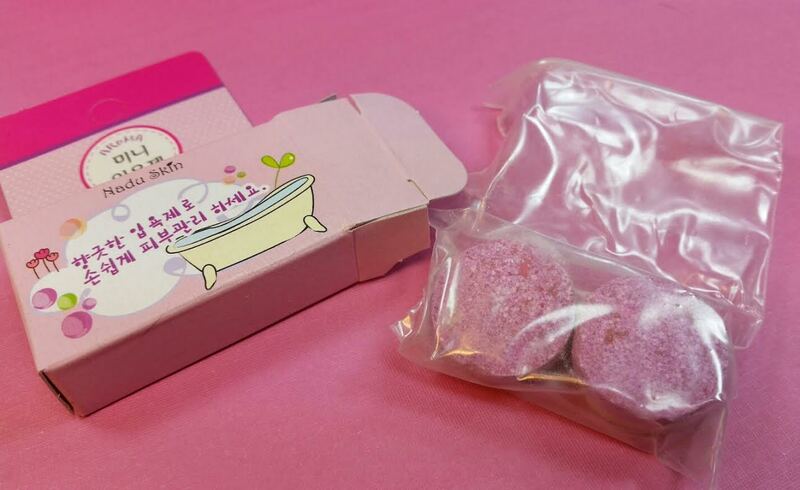 It's a fun way to try famous brands like Skinfood, Tony Moly, Holika Holika and Lioele. They don't have everything but they've been adding new brands weekly and there are some I'm really hoping they get. Milky Dress Pink Lovely Fast Shampoo-200ml- This is a hydrating and repairing hair shampoo that contains ingredients to calm the scalp and strengthen hair. It is also good for thinning hair. This one product was the reason I got this box. Rachel at Harlot Beauty has raved about this shampoo and how it helped her with her hair loss. I have thin hair and I want to keep what I have so I was interested. It's definitely pink and it smells faintly herbal. I haven't tried it yet because I'm getting frustrated with all my open product and have made a pact that I can't open anymore until I get rid of something. Haha! Nadu Skin Aroma Mini Bathboom- These are mini bath tablets that color your bath and are infused with essential oil. There are four tablets. I cannot open the package because I can already tell there is lots of lavender oil in these. Drat my allergies. Swanicoco 100% Natural Peeling Herb Pack-25ml- This is a peeling pack made with medicinal herbs. 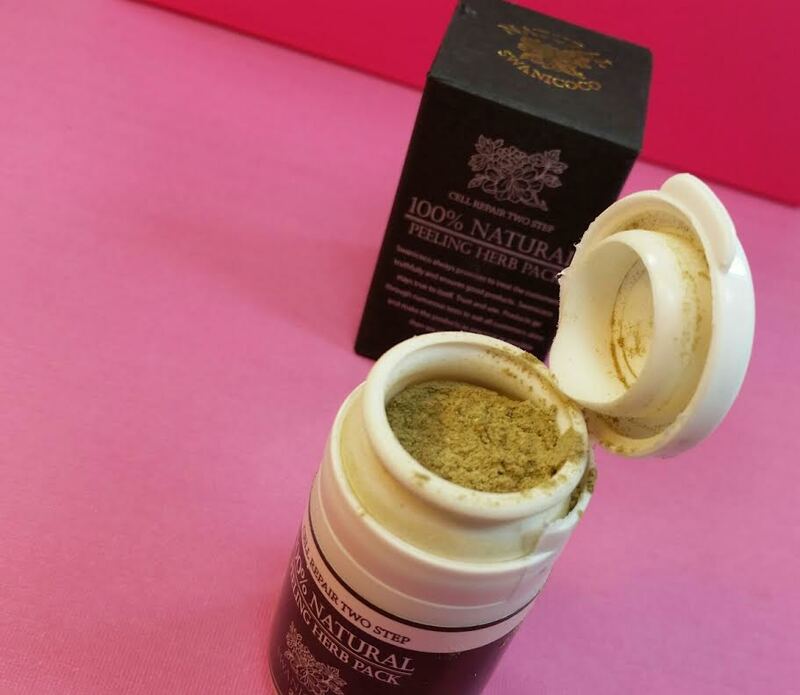 It can be used on the face and body for exfoliation. I don't know why it's called a peeling pack because this is actually a powder exfoliator. Mix the brown powder with water on a washcloth and add a body wash to make it lather. Then scrub a dub dub. Seems weird but I'm game. 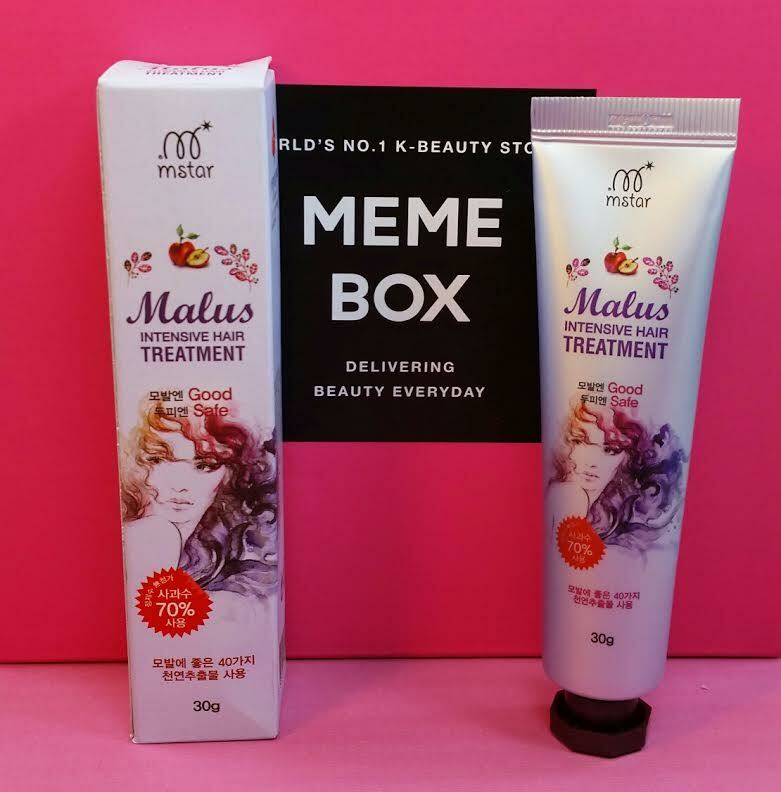 Mstar Malus Intensive Hair Treatment-30g- This is made with apple extracts, ceramides, panthenol and 40 different kinds of natural ingredients. This is for moisturizing dry, damaged hair and resulting in glossy ends and healthier scalp. After towel drying hair, apply the treatment using a brush. They also recommend putting on a hair cap and letting it sit for 10 minutes. Must be a leave in treatment. It smells pretty good and my ends are dry and scraggly and could use some love. 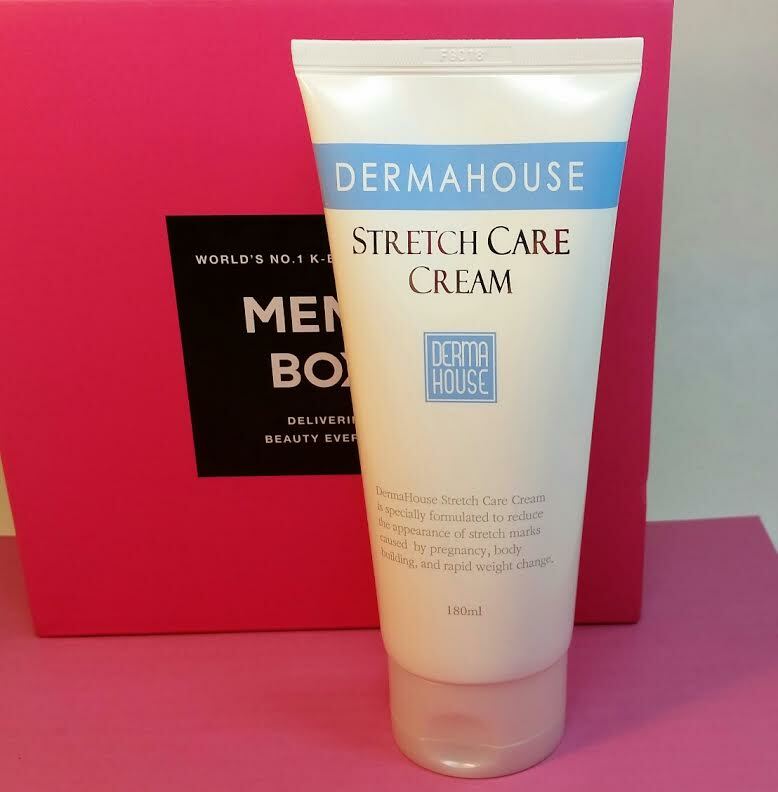 Dermahouse Stretch Care Cream- This is a thick cream for reducing the appearance of stretch marks. 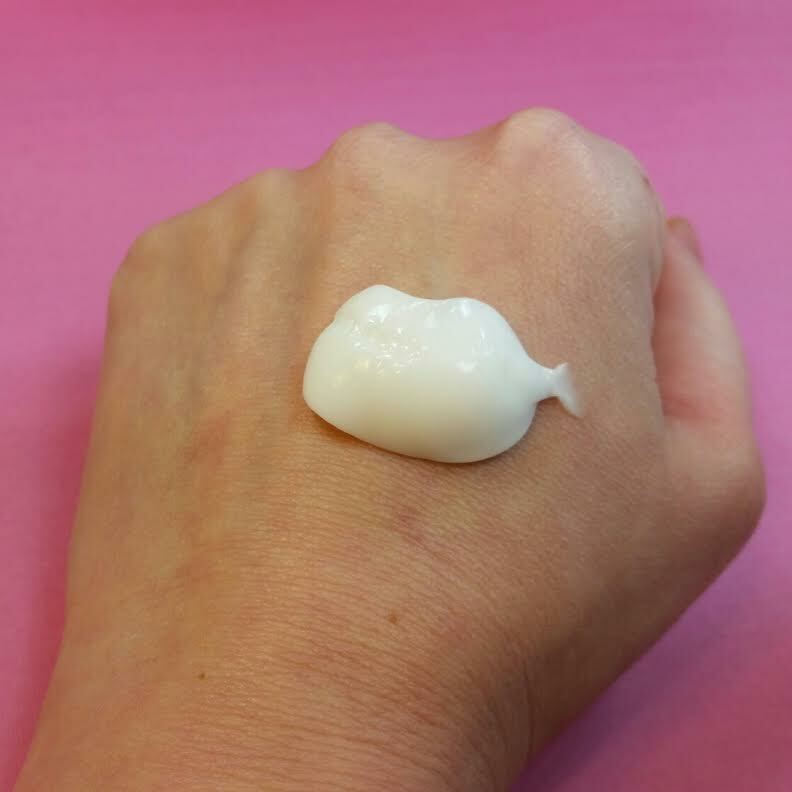 It's quite thick and a little greasy but it left my skin so so soft. I feel like it has lavender in it because it makes my throat itch. Aw, bummer! It does. Nooo! I think this could just be used as an overall body moisturizer. I like the Dermahouse brand so I'm sure it's plenty good at hydrating plus it really does make my skin so soft. I don't think I could deal with the lavender in it. At least I can promise you that it is actually real lavender oil. I'm only allergic to the good stuff. 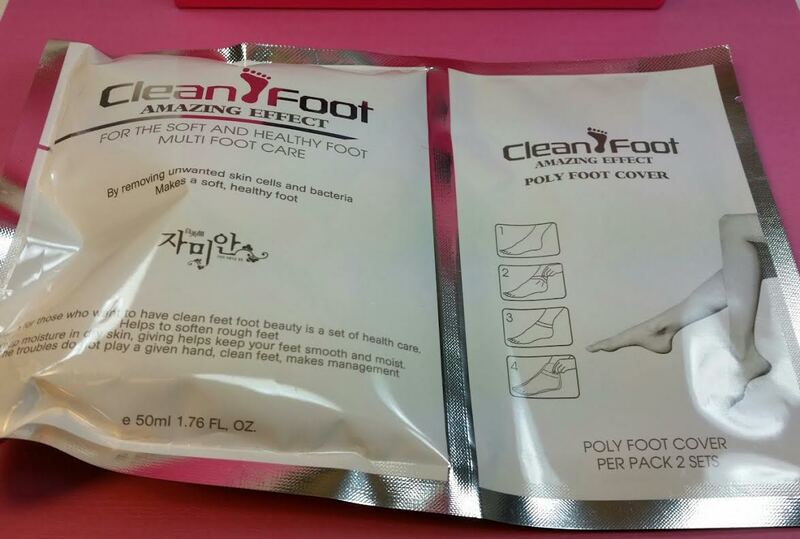 Zamian Clean Foot- Okay, umm.. besides the shampoo, this turned out to be my favorite thing in the box. It's toe socks!! For peeling all the skin off your foot! They're wet like a sheet mask and they're made out of cotton. They're pretty thick, too. 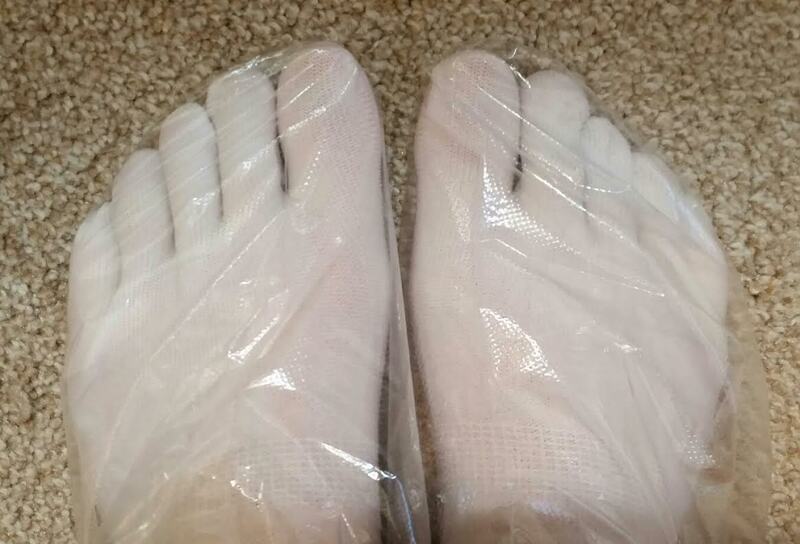 I've done a couple peeling foot masks like this but none of them have been toe socks. This comes with two cloth socks and two plastic foot covers. Of course they're genius and I can't believe I never thought of this but in order to keep from killing yourself in plastic death-wish socks, they recommend putting a pair of your own socks on over the plastic ones!! How have I never been this smart?! Instead of nearly dying while trying to go downstairs, I could've been doing this! Value: Memebox says $36 but I doubt it. VERDICT: The regular price of this box of this box was $29.99 (including shipping). 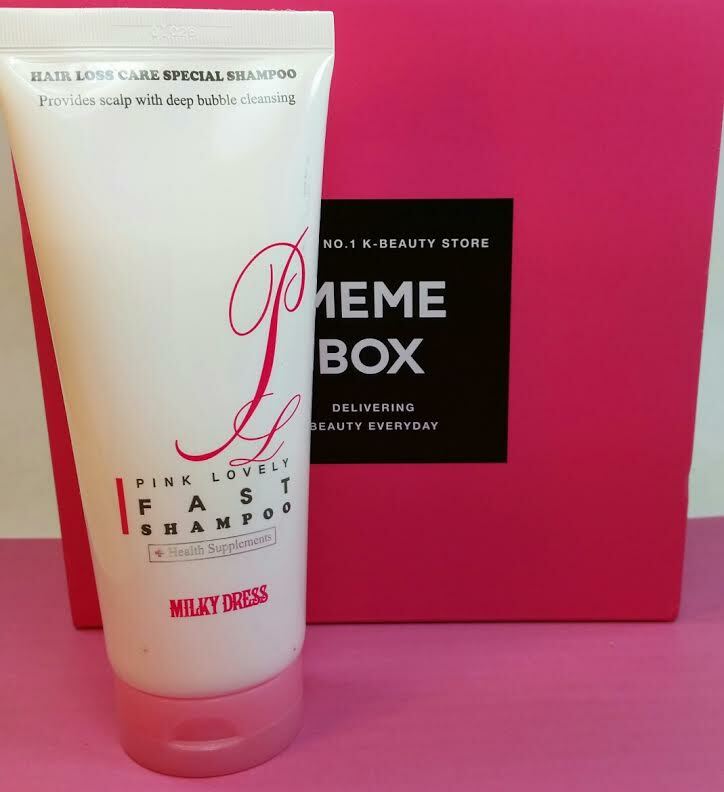 As I mentioned before the box was worth it because of the Milky Dress Pink Lovely Shampoo with is normally $18 plus shipping from Korea. Since I would have paid that, the rest of the box is a bonus. 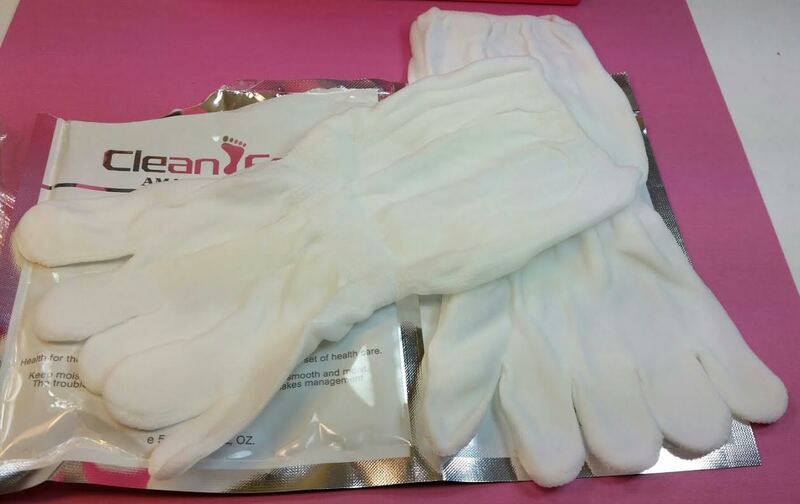 The toe sock foot peeling set is so awesome. I've got another 20 minutes before it's time to take them off. I'm actually really disappointed the Dermahouse has lavender in it. It left my legs so soft and hydrated but I'm still dealing with the aftereffects of the lavender. 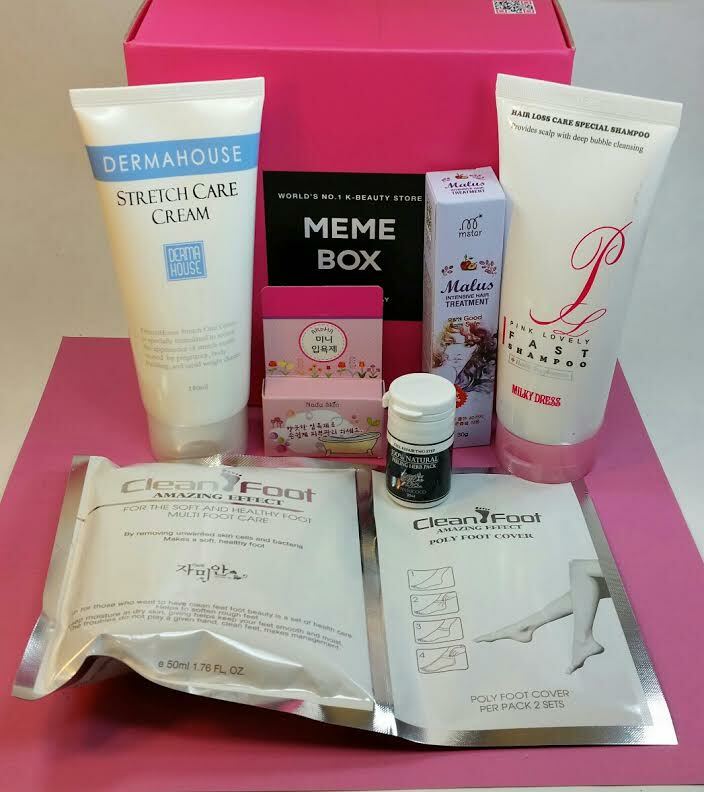 Memebox has changed a lot since this box was released. Boxes now ship from the USA and the contents are usually no longer a mystery. You can see the available boxes on the Memebox website here. They've got a lot of collaboration boxes right now with Korean makeup and beauty gurus. If you're interested, you should check them out! There is one box I recommend for skincare goodness and that is the Nature Box. The brands are good and the products included are useful with good ingredients. If you are looking for coupons, check out my Memebox Deals page. There haven't been many and this month there were no $3 or $5 off coupons. Hopefully that will change. I'm pleasantly surprised that they stuck with the theme well on this one! AND THOSE SOCKS! Are they reusable as regular toe socks? That is so incredibly genius. And those Memechanges are crazy. I'm kind of bummed that the boxes are hardly ever a mystery anymore -- that was half the fun. I guess I'm the minority, but with this new shipping arrangement (as with all things ground shipping), everything I ordered is taking way longer to get here than before! I really wanted to try that shampoo too after Rachel wrote about it, lol. Not enough to grab the box though. But I do have to say, those socks are pretty fancy for a peeling mask. Spa edition indeed!